Product #15878 | SKU YN560-III | 0.0 (no ratings yet) Thanks for your rating! YN-560 III YN560III YN560 III is almost identical in specifications to the YN560-II except for one addition: integrated radio flash triggering. in that it will respond to a RF-602 or RF-603 on-camera transmitter without the need for an additional receiver. This is via it's RX slave mode. RX slave flash mode can be selected though pressing down button [Triggering Mode]. 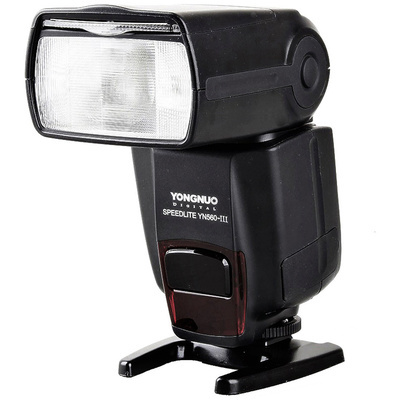 The slave flash mode is transmitted by 2.4G radio, respecively supporting YONGNUO wireless trigger RF-602, RF-603. This is set up through through the Advanced Options settings, provided with 16 channels (CH1-CH16). Just set the YN560-III and RF-602, RF-603 to the same channel. Use RF-602 or RF-603 2.4G ultra-long-range wireless flash system at distances up to 100 meters. ZOOM button, covering a focal length between 24 ~ 105mm cycle movements. Various trigger synchronizations possible using, S1 and S2 to avoid the pre-flash-sensitive trigger. The YN560-III is equipped with an external power outlet, to meet a higher demand for refresh speed.